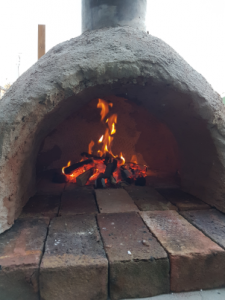 Check out some pics of the latest rev of our pizza oven, which had it’s first run on Saturday at our Birthday party. When we built our first pizza oven in Chancery Lane, it became a regular feature of our Open Socials and other events. Having our own dedicated yard in Chancery Lane, meant that we could build a permanent one outside. Blackpitts is an amazing space for us, but we do not have our own dedicated yard. We have a shared car park. We’ve built the oven temporarily on special occasions, but we have to take it down the next day. It’s always been the plan to make a mobile one that we could push out as-required. Over the last few months we built that mobile version and it had its first successful run on Saturday at our party. Drop in to our regular open socials to see it in operation. This was written by gary. Posted on Sunday, January 28, 2018, at 9:52 pm. Filed under Project, Social Night. Bookmark the permalink. Follow comments here with the RSS feed. Post a comment or leave a trackback.